The Lens is the New Orleans area’s first nonprofit, nonpartisan public-interest newsroom, dedicated to unique in-depth reporting projects, as well as exclusive daily stories. Our mission is to educate, engage and empower readers with information and analysis necessary for them to advocate for a more transparent and just governance that is accountable to the public. Our aim is to report stories that others aren’t or can’t. Increasingly, traditional newsrooms are facing budget cuts and have been curtailing longterm investigative reporting because it tends to be the most expensive kind of work. We’re here to fill that gap. Without the pressures of filling a daily newspaper or newscast, our staff can dedicate significant time and effort into deeply reporting and analyzing information. As an advocate for openness, we provide readers with the source documents used in our reporting, inviting them to check and challenge our work, or to build on it through their own research. Co-founders Karen Gadbois and Ariella Cohen began publishing The Lens in January 2010. 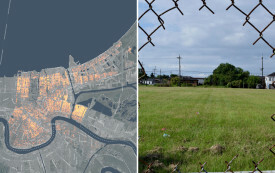 The city has granted more than 24,000 demolition permits since Katrina. The Nation partnered with The Lens, a nonprofit newsroom in New Orleans, to explore the fate of those properties.